Does the Tata Nexon’s bold crossover design package an equally able machine underneath to tempt buyers away from the traditional square compact SUVs? Tata Motors may have arrived late to some of the buzziest segments in the Indian car market, but with each successive launch Tata has made a bigger splash. This time around it is the Nexon that has arrived late to the compact SUV party, but it makes a very fashionable entrance and hopes to change our expectations of brand Tata. With the power of brand new engines, more features and a design that is meant to wow, it makes a whole-hearted attempt at tempting you away from the competition. But, what is the Nexon really like? We spent a day with the petrol and diesel variants of the Tata Nexon to get some answers. The Nexon could well be the concept car that was showcased in 2014. As you can see only the show-car bits like the LED headlamps and cameras that were used instead of ORVMs have been replaced. So that means the Nexon carries on with the swoopy crossover stance. The face wears a look we have seen on newer Tatas, although the large flared headlamps add a new twist. Inside it are LED DRLs and projector lamps but there are no LED headlamps here. The Nexon, like its competitors, is just under four metres long, but at 1811mm the Nexon is the widest. Its 2498mm wheelbase is almost as much as the Maruti Suzuki Vitara Brezza, but smaller than the Fords EcoSport. Still, it looks like a well-balanced design. The Nexon’s best angle has to be the profile; it looks sleek and sporty, but tough. The way the grey colour roof swoops down like a coupe, contrasts with the rugged plastic rub-strips. The white sash that runs along the window line is a signature element, but the finish isn’t slick enough. At 1607mm, the Nexon won’t stand as tall as its Japanese and American competition, but the 209mm of ground clearance, when unladen, has it standing well clear off the ground. The chunky 215/60 R16 tyres that peek out at all four corners give it a very confident stance. The really dramatic part of the design has to be the rear. The white sash continues to flow in here and wraps around the diced tail lamps that pack smooth LED lamps. The finish of the white band is much better here as it is made out of metal, whereas it is in a special plastic design at the side. The bumper looks chunky and is actually integrated into the tail gate! Don’t worry though, as the bumps and scrapes will be tackled by the tough grey plastic section that juts out a bit from underneath. Overall, the Nexon is a sporty looking machine that might not win SUV lovers who want a traditional and square design. But it is clear that Impact design language is infusing a distinct flavour into Tata products. For instance, the Nexon has a few wild secrets too. As a tribute to the Indian sub-continent, there is a lioness and a cub on the rear windscreen, and as if to make a point, there’s a tiger in the large glove box too! Apparently, they do. Especially if you start from the second row. When you step inside, the first thing you wonder about is if this really is a sub-4m SUV. Seating six-footers? No problem! The coupe like roofline shouldn’t foul with turbans either. Surprising? Very! There’s plenty of room for long shanks too. Three-abreast? Sure, sort of. It is wide enough to accommodate three, but the middle occupant will have to deal with a shorter seat base and a protruding backrest. For two, the smartly scooped out backseat is going to feel like a treat. We're nitpicking, but the cushioning could've been firmer and set a bit higher for better under-thigh support. Passengers at the rear are treated to dedicated air-vents with a two-stage blower, though. This takes some time to get things cooled as this unit picks up the air from the side of the floor mounted unit and shoots it out towards you. In terms of design, the steering wheel and instrument cluster are familiar, but the restrained dash design, the colours and the infotainment screen propped up on the dash make the Nexon look like a European luxury car! The highlight of the infotainment system has to be the sheer genius of mounting physical control buttons that are mounted under the aircon vents at the centre. These shortcut keys and dials fall easily to hand and allow you to navigate through the menu easily, reducing the need to take your eyes off the road. The interface also prefers it if you use these buttons, responding in a properly snappy manner; poke a finger at the screen and the response is just a bit reluctant. The cabin of the Nexon strikes you to be more impressive than its rivals too. Fabric for door pads, the glossy silver panel on the dash and the textured plastic for the dash top look good and feel solid too. The plush switches for the power windows and well-damped stalks for wipers and indicators add to the experience. But, as you look closely, the way it comes together doesn’t inspire too much faith. Improper shut lines, scratchy panels and the loose console for the power window adjustment on the cars were disappointing. There are some ergonomic gaffes as well. For instance, to get to the USB port will require dainty hands. Under a cool rolling shutter, officially known as the Tambour sliding door, are two shallow cup holders, which will be impossible to use because the opening is narrow and the bin is deep. Thankfully, the front doors get full-size bottle holders and the party trick here is an umbrella holder. The umbrella, though, needs to be a short one and requires force to be wedged in. The Nexon gets a flip-up tailgate, which gives you easy access to the 350-litre boot which is not class leading. But the second row splits and folds flat to give you lots of flexibility to carry passengers and luggage. We expect the Nexon to be made available in four variants for both engine options. Crucially, ABS, dual airbags, cornering brake control and brake assist will be available as standard across the range. Under the hood of the red machine is a 1.2-litre turbo-charged petrol, while the blazing blue machine has a spanking new 1.5-litre diesel engine. Both motors make 110PS of power and come combined with six-speed manual gearboxes. Automatic transmission options, via cost-effective AMT tech, will be available by Auto Expo 2018. The engine that got us hook, line, and sinker was the Revotorq four-cylinder diesel. Start up the motor and some diesel rumble and light vibes can be felt in the cabin, but as you get going, the cabin starts to feel smooth and plenty quiet. The big win for the diesel is its drivability. Tata claims that it makes its peak torque of 260NM from 1500rpm to 2750rpm and that means it should be quite easy to drive even in the city. Actually, it’s better than what numbers suggest, as you get genuinely usable drivability from as low down as 1000rpm! and still drive around comfortably. Cruising calmly through city streets at 30kph in 4th gear or 20kph in 3rd comes naturally to the Nexon. The throws on the new six-speed gearbox are long, but clean shifting along with the light clutch, makes stop and go driving even better. At times, drive modes can feel like gimmicks and the Nexon has three - Eco, City and Sport. These modes alter the torque and responsiveness on offer and each one of these actually offers a distinct advantage to the driver. For instance, in City mode, the spike in power at 2000rpm is flattened out and this will make tackling bumper to bumper traffic much smoother. If you want everything the Revotorq has got, switch to Sport mode. Now the rush of torque feels apparent from 2000rpm and the rev needle responds to throttle inputs with more eagerness too. This mode can be put to good use when in a hurry or for overtaking on the highway. The Revotorq loses a bit of steam past 3000rpm and it’s best to upshift earlier than the near 4500rpm rev-limit. But, you don’t really need to flog this engine to get the best out of it. Surprisingly, the Eco mode is usable too. While throttle response is dulled and there is less fizz from the engine, it doesn’t feel frustratingly dull. The diesel Nexon weighs 1300kgs, which makes it 100kgs heavier than the Brezza, but we expect real world performance and fuel efficiency to be quite strong. The petrol option is a more nuanced taste. The Revotron badge is slapped on a three-cylinder engine that is based off the Tigor’s unit. For the Nexon, Tata has added a turbocharger to bump up the punch. The petrol engine feels particularly enjoyable in Sport mode. The throttle response is sharp and you can feel the spikes in power delivery clearly. It just gives a ragged but fun feel. The big dollop of torque in the mid range makes it quite eager and we found wheel spin accompanying the mash of the throttle. In Sport mode, the engine unlocks a few more revs and redlines near 6000rpm. Where the petrol engine doesn't feel quite as impressive is while commuting. Even in the City mode you will need to work the gearbox often, because when the revs drop below 1500rpm, there is the sluggishness of turbo lag to deal with. Secondly, response to throttle inputs can be a a bit disjointed and reaction to on-off throttle inputs make it feel a bit jerky. Nope. The Nexon is a confident creature. The hardware is par for the course with front-wheel drive, MacPherson Struts up front and a non-independent twist beam at the rear. The good news is that the Nexon can really clobber the rough bits and shocking rude potholes with its 215/60R16 tyres, letting only a mild whimper filter through to you. Over really bumpy and uneven roads, you do get some side-to-side tossing around, but nothing we would term as disturbing or alarming. Now, when you show the Nexon some twisties, you get remarkable obedience. 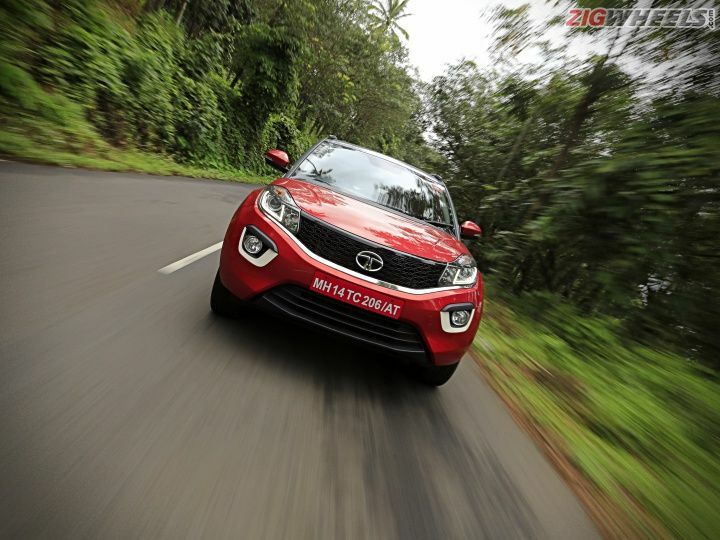 The grip from the Goodyears was confidence inspiring as the Nexon picked its way up the curves that draped the ghat as we climbed up towards Idukki. Hustling the Nexon was plenty enjoyable and we’d happily do it again. In some ways, the petrol felt more enjoyable, as its nearly 70kg weight advantage made it feel more involving and immediate when attacking the corners. You just had more feel at the steering wheel and it was a lot more eager to change direction too. While both Nexons share the same disc and drum brake setup, the Revotron’s brakes felt more responsive and easier to modulate. The Nexon is a remarkable product from Tata; a bold crossover that combines standout form while packaging in immense practicality too, and if it weren’t for the the fit and finish issues, we would recommend it without hesitation. Especially the diesel. No kidding, the Nexon is likely to set segment benchmark on account of its very easy to drive diesel engine, and the big car levels of space in the cabin. On top of that, the Nexon is a neat and tidy handler and comfortable to be chauffeured around in too. The petrol is exciting when driven hard - but for everyday use you’d wish it offered smooth and more fluid performance. And, yes, the design is striking, and this Tata has all the features you need. The Nexon is expected in Tata showrooms before Diwali and will be priced between Rs 6.5-10 lakh. Automatic versions will arrive in early 2018 and will round off the Nexon range nicely. Now, if Tata could calm our nerves on questions of longevity, the Nexon would be a product that wouldn’t need aggressive pricing, it would sail through on merit alone.